WDI-Gaston Villain Profile Pin LE 250. Mint condition on original backer card. Pin pictured is the pin you will receive. 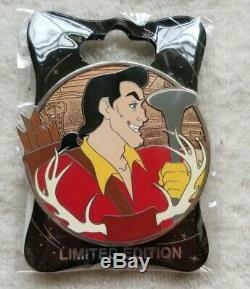 The item "Walt Disney Imagineering WDI Gaston Villain Profile LE250 Pin Beauty & The Beast" is in sale since Sunday, March 10, 2019. This item is in the category "Collectibles\Disneyana\Contemporary (1968-Now)\Pins, Patches & Buttons\Other Disney Pins & Patches". The seller is "dardooder" and is located in Greensboro, North Carolina. This item can be shipped to United States.